Referring back to our styling principles, the first thing we need to look at is the functionality of the room. What is the room for, how do you want it to feel, and what is the focal point? This is particularly important in regards to a living area, because a living area can mean one of several things. A living area could be the room where the whole family likes to gather and relax and may or may not include a TV. It could be more of a sitting room, which can take the form of either a formal sitting room or an informal sitting room. You may like to have a room that is off limits for the kids and where you like to entertain. Or, it could be a media/rumpus room. This decision will guide how you will style the room from this point onwards. Next, we need to look at what lighting the room currently has, and does it need to be changed or added to. For a living area, regardless of what the space is to be specifically used for, I recommend the use of a combination of both general/ambient lighting and mood lighting. General lighting would be your overhead, built-in down lights, for example, and mood lighting may incorporate some table lamps and/or floor lamps, which create mood and atmosphere of an evening. I would also highly recommend putting your general lighting, that is, down lights for example, on a dimmer, so that the level of lighting can be controlled. Harsh, bright lights are not conducive to relaxation and ambience! Another factor which is crucial is how many people does the room need to accommodate. Again, going back to, what is the room for and how do we want it to feel, if it’s a more formal sitting area, it may need to accommodate less people. If it is a family living room, then obviously it will need to seat every member of the family, plus a couple extra for guests. If it’s a living room wherein which you want to entertain, that needs to be taken into account also. I always recommend seating as many people as is practical without compromising the feel of the room. We always need to remember flow and easy movement of traffic throughout the room. Don’t try to squeeze in extra chairs which block walkways and close the room in. Seat as many people as you can while leaving ample space in the room. A room, like a fine wine, needs to breathe. The next thing we need to consider is what is the focal point of the living area. Obviously again we go back to, what is the room for. If the room is to accommodate a TV, then obviously the focal point of this room will be the TV. If you want to take the focus off the TV, there are options these days that can help. You could buy a TV that while it’s off looks like a piece of art, or you could wall-mount it and build it in above a fireplace, which takes away the harsh effect of the TV being such a focal point of the room and softens a room as it’s incorporated into a fireplace. If we don’t need to incorporate a TV, we need to decide what the focal point then is. If you’re lucky enough to have a fireplace in the room, that will be the focal point of the room, and we would place the furniture around that. If the room doesn’t have a fireplace and is to be a living area without a TV, you could either incorporate additional seating, as there will obviously be one main wall where you would have traditionally put an entertainment unit and a TV. Take away the TV, and we don’t need the entertainment unit anymore. Therefore, we could use these for additional seating, so an additional sofa up against the wall which some beautiful artwork behind it, or a beautiful sideboard, again with a statement piece of art above it, then we style around that. Once you’ve decided on the focal point of your living area, you can start thinking about the floor plan. We’ve got focal point and how many people you want to accommodate and what the room is for. It is definitely time to start thinking about the floor plan. Consider a combination of perhaps a sofa and some armchairs, or a modular sofa and one armchair, a coffee table, a side table, and as I’ve mentioned before, a combination of table lamps and floor lamps. Just mix it up to keep it interesting. Don’t feel like you have to have matchy-matchy, a three-seater sofa, and two-seater sofa as the resulting look can be a little bit underwhelming. Having a combination of sofa and armchairs provides the opportunity to mix up your textiles, colours and patterns, and create additional interest and warmth in the room. As we are thinking about the floor plan, we also need to think about what are the must-have pieces? 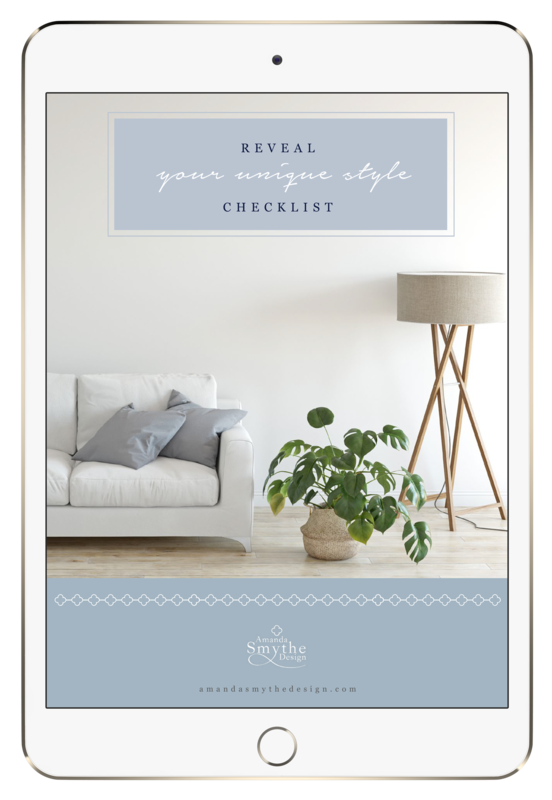 Once you’ve identified the focal point of the room, make a list of all the must-have items in the room. These include all the essential pieces in the room for functionality. If it’s a room including a TV, these would be seating for however many people you require, an entertainment unit, a coffee table, a rug, for example, and if you have the room, potentially one or two side tables. Once you have your essentials in place, you can think about any additional pieces you may have room for, which include decorative pieces. If you have a little bit of extra room in your living area, there may be a little alcove or an extra wall that needs filling, a buffet or sideboard may be an option, again with a beautiful mirror or statement art on top of it. This then provides additional storage and an opportunity to place some decorative items on top, and again, add warmth and interest to the room. There may a small area for a console, an additional side table, a floor plant, armchair, or as I’ve mentioned before, a statement floor lamp. Now that you have in place all the essential items, you’ve considered functionality and your floor plan, you need to think about the style that you’re wanting to achieve. If you carefully consider the style that you’re wanting to achieve, you’ll achieve a far more cohesive look. It’s a great idea to look at magazines, search Pinterest, and just tear out the pages you like, pin the pictures you like, start some mood boards, and eventually you’ll see a certain look emerging. Pick out the elements from that style you like and start applying them to your room. You also need to look at the bigger picture and take into account the style of the rest of your home. 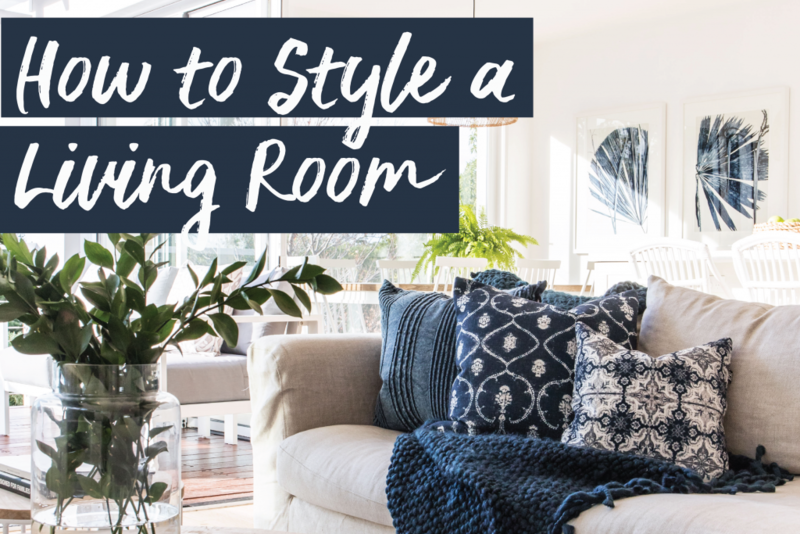 While I’m a big fan of every client of mine finding their own unique style, I certainly wouldn’t recommend having clashing styles in every room. There needs to be a cohesive feel in the house. Artfully combine pieces from your chosen style with some personal items for a look that is unique to you. Through honing your style a colour palette, or at least a suggestion of one, should emerge. However, if not, you need to select one that is complementary to the pieces you already have in place. Go back to the very beginning and think about what the room is for and how you want it to feel. You may want to make a big statement in this room, wherein which you can look at using more colours, maybe wallpaper, or you may want the room to feel very light, airy, calm and relaxed, in which case you’d be leaning towards a more neutral palette. Neutral palettes are great, and for longevity, I do recommend leaning towards a neutral palette. The great thing about a neutral palette is that you can update your colours and styles any time you like, and bring in the colour with your artwork and soft furnishings. Keeping neutral with your big-ticket items means they will last you a lot longer. Now, selecting your colour palette and artwork are quite intermingled because one relates to the other. You need to make the decision which comes first in this case because it can go either way. You can either choose your colour palette first if you’re buying new artwork and purchase your artwork around that, or if you have existing artwork that you would like to use, you can decide on the artwork first and then work backwards on the colour palette for that. Draw the colour palette from the artwork. Choose two or three colours in the artwork that work together and choose your soft furnishings from there. This will result in a beautifully cohesive room. You also need to consider the scale of the artwork. I’m always a big fan of, “Bigger is better.” If you can go as big as you possibly can without it swallowing the room. Be sensible but there’s nothing worse than seeing artwork on a wall that is too small, so really work on getting the scale of the artwork right. You may also want to think about multiples. If you have a big sofa with a wall behind it, it may lend itself to two or three matching artworks. Similarly, above a buffet or a sideboard, either one big statement piece, or two or three, again can have a really great effect. Lastly, we get to the really fun part, which is selecting your soft furnishings and layering them up. This is where you really get to add the icing on the cake and pull the room together. Really enhance the colour and warmth, and feel the room come to life. Ensure that when you’re choosing your soft furnishings you need to refer to your artwork and take your cues from there. As I mentioned, choose two to three colours from the artwork and then select cushions in those colour families. If you’ve gone for a more monotone look, say you like all blues, it doesn’t need to be boring. You can have a whole lot of different blues or you can do a whole lot of different patterns. Just mix it up with your textures, patterns, as much as you can. I like to use as many cushions as I can get in and is practical. They just add so much life and colour to a room. It’s great to add a throw, which also adds colour, texture and warmth, and is very practical for chilly nights. Maybe not so much in a formal sitting room, but definitely in those living areas where your family comes together to relax, particularly if a TV is in the room. When considering warmth and layering a rug is essential, even if you have carpet in the room. Rugs are great for pulling the room together and zoning the room off. Rugs are the artwork of the floor, so you really need to consider again both functionality and style. If the room is to be a high-traffic area, for example a rumpus room with loads of kids coming in and out, obviously you want something very hard-wearing and practical, but that doesn’t mean it can’t look nice. Think natural materials, like sisal, hemp, seagrass or jute. These add great warmth and texture and are perfect for high-traffic areas, as they’re very hard-wearing. If the area is more of an adults area such as a sitting room, you can consider something a bit more delicate and paler in colour if that’s what the style of the room calls for. When choosing a rug, consider your colour palette, artwork and soft furnishings. If you’ve chosen a busier rug, I’d recommend more muted soft furnishings, and on the flip side, if your soft furnishings incorporate a lot of colour and pattern, potentially go for a less busy floor rug. You also really need to think about the size and scale of the rug. A rug that is too small for a room doesn’t look good. Ideally, the rug should be big enough so that it sits just under the feet of the furniture, particularly the sofas. A properly sized rug and will make the room feel bigger. A rug that’s too small does not anchor the room properly and will have the effect of making the room feel smaller and more cluttered. Lastly, you need to add your final décor items. These include plants, flowers, candles, coffee table books, items from your travels, photos, et cetera, just group them carefully so that they’re pleasing to the eye and not too many. We want to avoid a cluttered look. If you need inspiration for styling vignettes, just have a look on Pinterest and you’ll see many examples.